The first Sunday of Ramadhan, I wanted to break my fast together with my family. I planned to come by a bit early to help my mum with whatever cooking that needs to be done. I left my hubby to sleep away at home and my bro will fetch him later that evening. Even planned to explore the Ramadhan bazaars at Tampines, while at that. 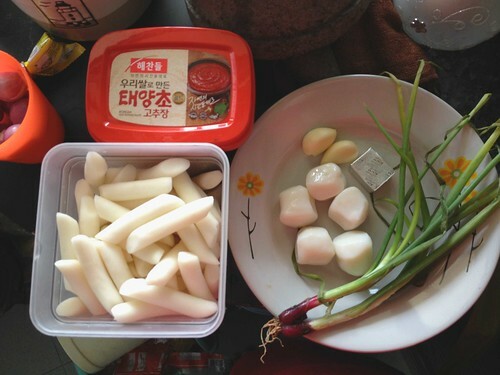 During my journey there in the bus, my bro called to say that I'm supposed to help my mum to make something like Korean rice cake (he had no idea)??? My eyes widened. What?! Why didn't she tell me? So right there in the bus, I fervently googled for 'Tteokbokki' (also known as 'ddeokbokki') recipes. I chose one with minimal ingredients, knowing that my mum will surely be unprepared. I chose THIS ONE. Upon arriving, I hastily asked her to show me what she had. Was relieved to see that she's gotten the tub of 'gochujang' (Korean red chili pepper paste). There's no 'gochugaru' (Korean red chili pepper flakes) but I guess some regular chilli flakes will do. So we end up with just these. Okay… Let's go! As I was preparing the ingredients, my mum was remarking how my dad made a fuss when she bought those stuff from the Korean food section at the supermarket. He was mumbling something about 'expired food'. So I picked up the tub of 'gochujang' and looked for the expiry date. Still within the stipulated date. While at that, I decide to browse thru' the ingredients… Erk?! It's too late to turn back when we were very much ready to start cooking. So this mother-daughter pair came up with this idea to make our rendition of the 'gochujang'. On the spot, with whatever we have. Red chili powder ('gochugaru'), glutinous rice powder ('chapsal') mixed with powdered fermented soybeans, salt and sweeteners like corn syrup. Chilli flakes, paprika, cayenne pepper (the more the merrier! ), corn starch, some 'taucheo' (local soy bean paste) and gula melaka (palm sugar). And another special ingredient. My mum's homemade chilli sauce. Then we mixed all that up. I then had a taste (later rinsed my mouth out since I was fasting). Miraculously, it's almost the same! No joke! So we gleefully proceed to cook. Mixed our version of the 'gochujang' with some anchovy stock (a bowl of water with half a cube of anchovy stock). Later, we put in the rice cakes. 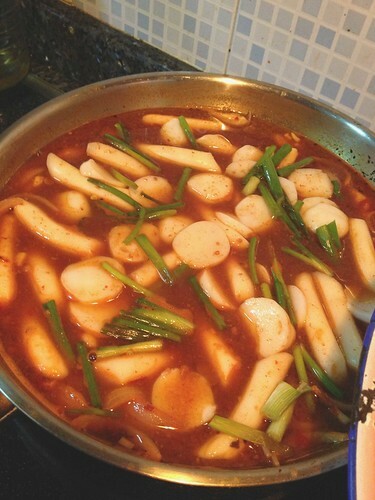 Apparently, the rice cakes will be left to cook in the stock like normal rice grains would. When it's time to break fast, I incidentally placed the pan in front of my hubby. He asked, "What's this?" I mentioned," Korean rice cakes." And what do you know? He immediately scooped some onto his plate. After some chewing (yes, it's pretty chewy), he he said it was alright. My mum and I hurriedly had a taste. We both decide that we've used a wee bit too much 'taucheo' for the taste was a tad glaring. Otherwise, it's pretty alright.